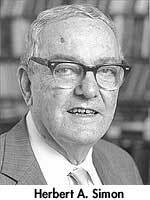 Pittsburgh, PA 02/10/2001 -- Carnegie Mellon University Professor Herbert A. Simon, winner of the 1978 Nobel Prize in Economics and many prestigious international scientific awards for his work in cognitive psychology and computer science, died Feb. 9, 2001 at the age of 84. Simon died at the UPMC Presbyterian Hospital in Pittsburgh, Pa., from complications from surgery in January. His research ranged from computer science to psychology, administration and economics. The thread of continuity through all of his work was his interest in human decision-making and problem-solving processes and the implications of these processes for social institutions. He made extensive use of the computer as a tool for both simulating human thinking and augmenting it with artificial intelligence. Simon was widely considered to be a founder of the field of artificial intelligence. A member of the Carnegie Mellon faculty since 1949, Simon had important roles in the formation of several of its departments and schools, including the Graduate School of Industrial Administration, the School of Computer Science and the College of Humanities and Social Sciences Psychology Department, where he was instrumental in the development of its internationally renowned cognitive science group. No one in Carnegie Mellons history more heavily influenced the universitys intellectual and scholarly approach or its academic culture as much as Herb Simon, said former university President Robert Mehrabian. During his distinguished career, Simon received international acclaim and many honors. In 1975, he earned the prestigious A.M. Turing Award for his work in computer science. In 1978, he received the Alfred Nobel Memorial Prize in Economic Sciences, and in 1986, the National Medal of Science. In 1993, he won the American Psychological Association Award for Outstanding Lifetime Contributions to Psychology. In 1994, he was one of only 14 foreign scientists ever to be inducted into the Chinese Academy of Sciences. In 1995, two prominent awards were presented to Simon by the International Joint Conferences on Artificial Intelligence (the Award for Research Excellence) and the American Society of Public Administration (the Dwight Waldo Award). He also was inducted into the Automation Hall of Fame in Chicago because of his pioneering work in the field of artificial intelligence. The Automation Hall of Fame at the Chicago Museum of Science and Technology recognizes individuals who have made major contributions to the practice and philosophy of manufacturing technology through advanced methods and research. Some 24 colleges and universities presented Simon with honorary doctors degrees. He received major national awards from the Association for Computing Machinery, the American Political Science Association, the Academy of Management, the Operations Research Society and the Institute of Management Science, among others. Simon was a Fellow or member of many prominent professional and academic organizations, including the National Academy of Sciences, the American Association for Artificial Intelligence, the American Academy of Arts and Sciences, the American Association for the Advancement of Science, the American Economic Association, the American Psychological Association, the Econometric Society, the International Academy of Management, and the academic and scientific honoraries Phi Beta Kappa and Sigma Xi. He also was an honorary member of the British Psychological Society. Simon was an emeritus life trustee of Carnegie Mellon, where he had been a member of the board since 1973. Until his recent illness, Simon was actively teaching and doing research at Carnegie Mellon. During his career, Simon has advised governments, business and industry. Speaking invitations took him all over the world and close to home. In addition to an immense publications list that includes books and journal articles, Simons pursuits in the field of computer science and psychology were detailed in an autobiography, Models of My Life, published in 1991 and re-issued in 1996. Profiles of Simon or stories about his research appeared in nearly every national newspaper and several magazines, including Psychology Today, Forbes magazine and Omni. Models of Bounded Rationality, Simons volume of economics papers, and Sciences of the Artificial, about his work in the field of artificial intelligence, are considered to be classics. A fourth edition of Administrative Behavior was published in 1997, the 50th anniversary of its original date of publication. Born in 1916 in Milwaukee, Simon earned his bachelors (1936) and doctors (1943) degrees in political science at the University of Chicago. He also held research and faculty positions at the University of California (Berkeley) and the Illinois Institute of Technology before coming to Carnegie Mellon. He is survived by his wife, Dorothea P. Simon, and three children, Katherine Simon Frank of Minneapolis, Peter A. Simon of Bryan, Tex., and Barbara M. Simon of Wilder, Vt., six grandchildren, three step-grandchildren and five great-grandchildren. The family requests in lieu of flowers that donations in Dr. Simons memory be made to Carnegie Mellon University, the First Unitarian Church of Pittsburgh, Morewood Avenue, Oakland, or a charity of the donors choice.